Very few events in the history of Assam have been elevated to the position of a spectacle. The Battle of Saraighat is one such event. A hero-like figure, Lachit Barphukan, emerged out of this battle. The event and the hero has become a hotbed of claims and counterclaims, both from inside and outside. 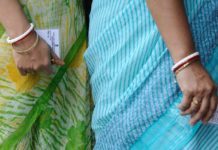 From the inside, the claims to Bir Lāchit have been on the backdrop of Assam Movement, where they needed a hero in their claims to nationalism, among others. One can also find very powerful and wide representation of Lachit in various literary works in Assam, from Padmanath Gohain Baruah to Kabiranjan Saikia, which throws interesting anecdotes for understanding the discourse of commemoration and the emergence of his image. From the outside, there is an effort to create a valorised figure who defended his society against the common enemy of Hindus—the Mughals. In this light, he has been equated to the likes of Shivaji or Rana Pratap. Such a portrayal of a hero, which is replete with the right-wing colours of nationalistic sentiments, has also found a place around his commemoration, albeit its rejection of such a historic intent whatsoever. Having travelled from local to the national, he has indeed become a spectacle of the contemporary caste Assamese society. 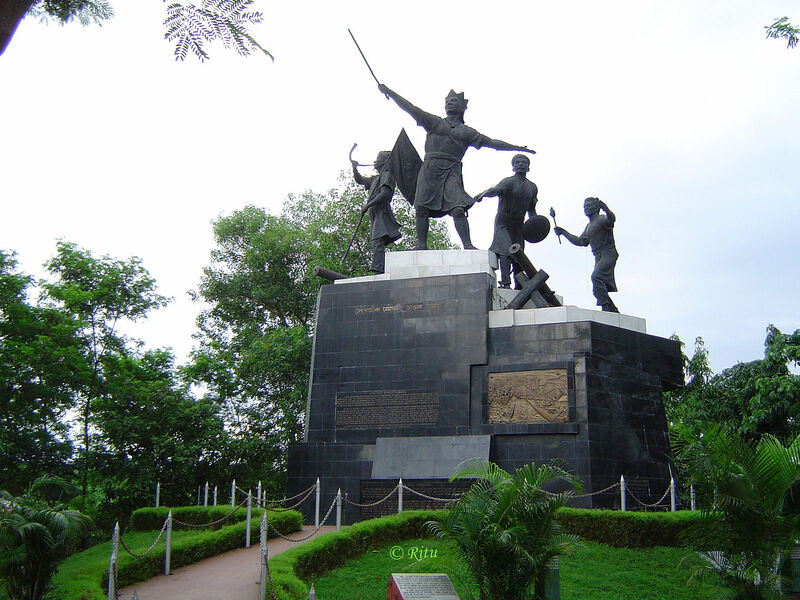 Contemporary sites of memory – public statuary and monuments – carry on with the cultural project of embodying and remembering the narrative of a glorious regional past by squarely locating it in the figure (both physical and symbolic) of the Ahom general Lachit Barphukan. However, as we argue here, through a study of the narratives that are to be found in an unnamed chronicler and a historian about Saraighat, the construction of Lachit Barphukan as the Ahom hero and its later usage by historians like S.K. Bhuyan was not just a twentieth-century production. By offering a close reading of a late seventeenth-century manuscript written in Assamese (We prefer Assamese or Axamiyā to twentieth-century bibliographer’s and philologist’s category of ‘Old Assamese’) we suggest that Bhuyan was strategically using the past in order to claim it as a moment of Ahom pride and glory. The Assamese manuscript titled Asamat Rām Siṇhar Yuddha (d. 1670) was purchased from a certain Kanthiram Paniphukan by Nagendranath Gogoi on 29 June, 1934. Bhuyan mentions the manuscript in his sources in the Assamese edition of his book on Mir Jumla and the successive Ahom-Mughal encounters. Apart from this there is no mention of the manuscript anywhere in the historiography of early modern Assam. There are 21 folios in the manuscript with 7 lines in each folio. However, it is most likely that some parts of the manuscript have been lost as the manuscript is incomplete and abruptly ends on folio 26 after folio 20 with nothing in between. The survival of the concluding page offers us a chance to date the manuscript – 1592 Saka or 1670 A.D. The manuscript appears to have been written by an unnamed scribe who accompanied the Ahom army to the battlefield of Saraighat and was a witness to the entire event. From the description of his activities it can be assumed that he along with two astrologers were part of a small group that fought with the Mughal army on the river Brahmaputra. This technique of fighting on the river described as jalajuddha in the manuscript clearly appears as a preferred combat technique by the Ahoms. Some of the other duties of the writer included appearing as the Ahom ambassador or the kataki to the Mughal camp in order to carry messages to and from the enemy camp. It can thus be argued that this short historical account also falls into the category that twentieth-century historians like Bhuyan would categorise as Kataki Buranji. Written in the manner of a report, this first-person historical account of the Battle of Saraighat provides every small detail about who were in the Ahom army, when they arrived at the battle field and the nature of the combat. The account begins with a long description of the arrival of the baruā, barbaruā, phukan, barphukan, dihingiā barua, hāzarika and others – the various rank holders in Ahom military and administration. The writer reports that all of these various rank holders upon arrival gathered together and conducted a mel – a particular form of Ahom practice similar to holding a court to decide on political and military strategies. He writes that they called upon the protector goddess Kāmākhya and asked her to be on their side during the battle. This account (folio 6) is preceded by a small section where the writer introduces the Ahom general Lachit Barphukan as the ‘younger child’ of Mamai Tamuli Barbarua (folio 4) – […] Mamai tamuli barbaruar putek sarujan lachit barphukan itakhulir (The younger son of Mamai Tamuli Barbarua, Lachit Barphukan from Itakhuli). Yet another interpretation of Lachit is around the etymology of the word. La means son, or the youngest son and Chit means seventh. So la-chit literally means seventh son. Sakarapheti Buranji mentions the names of the seven sons of Mamai Tamuli—Laluki, Lachit, Bhardhora, Onga, Morongi, Baduli and Daukoria. This sits well with the etymology of the word. A more radical narrative is also available, written by Mahandra Bora, of which Nogen Hazarika writes about in Kathi Seleka Buranji,that there is no address of Lachit’s parents. He was found crying in a jungle from where Mamai Tamuli picked him up and raised as his own son. All the ministers and the soldiers together conducted Mel: They prayed to Kamakhya: asked her blessings: Oh mother: In the battleground: protect us all: Having said this they praised her: And in that society (of generals and soldiers) they vowed: In the face of death in battlefield: We will cut to pieces using this hengdan (the Ahom sword): In the next life [after this] we will be born with the gods. Such passages extolling the bravado of the Ahom generals are present in almost every extant folio. However, the most interesting aspect is the manner in which they are narrated. One can note similar style of narration in Bhuyan’s Assamese account of the Battle of Saraighat which too uses dialogues in creating a dramatic tale of Ahom heroism. The mention of hengdan in the manuscript – the Ahom sword resembling a long blade – is particularly significant. Materials like hengdan along with the gamosa (the Assamese cloth worn around the neck) became the symbol of Ahom maleness and nationalistic bravado during the twentieth century. Thus, even in histories written by Bhuyan and others the hengdan of Lachit Barphukan was represented as a weapon of Ahom glory in face of the marauding enemy. The Ahom ambassador in his short historical account takes utmost care in mentioning every detail about the armour of the Ahom army in the battlefield of Saraighat. Folio 6 ends with a long catalogue of the various war gears of the baruā and hāzarika. In folios 7-10 he provides a vivid account of the strategies of planning the war and combating the Mughal army both in land and water. It appears from his description that the Ahoms preferred to take on the Mughal army in water since this was a difficult and unknown terrain for the later. Thus, water warfare and the buruj (the small boat like structures on which the army was stationed) played an important role in favour of the Ahoms in the Battle of Saraighat. The ambassador also provides sketches of the war plan that chart out the position of the army (folio 12) in the battlefield. These details were later used by Bhuyan in order to flesh out his dramatic tale of the indomitable Ahoms and their resistance in face of the Mughals. Folios 13-20 provide daily accounts of the battle – both in land and in water. These are lively descriptions of what the ambassador scribe terms as thalayuddha (combat on land) and jalayuddha (combat on water). It is quite clear from these descriptions that the Ahom army had quite an eclectic constitution. Almost everyone from the hāzarikās, barphukans, pandits, bhakats to ganaks and others fought against the Mughals in this battle. The mention of bhakats (folio 13) is particularly important here as the people known by this designation were mostly disciples associated with the various Vaishnava monastic centers in the region. Their presence in the Ahom army has seldom been paid any attention whatsoever (recently, Indrani Chatterjee has documented the presence of monastic militia in northeast India). In fact, it is commonly believed that the Ahoms and the Vaishnava monastic disciples were for most of history antagonistic to one other. However, if we look closely into the history of Ahom-Vaishnava history, we will find that a large number of the paiks or the foot soldiers of the Ahoms shared a deep connection with the monastic centers. They were an integral part of this devotional world and swore allegiance to the Vaishnava preceptors and gurus. Thus, it is not quite unlikely that the bhakats could have been drawn to the army in order to fill in the ranks in the battlefield at a time when both men and arms were needed in increasing numbers. However, it could also be true that the Ahom ambassador scribe (much like Bhuyan) mentioned them in order to portray the picture of a warrior society where every male member (from various ranks of social life) came together in fighting for their land and the sovereign. This short historical account written in Old Assamese occasionally uses Sanskrit ślokas in the middle of the narrative. These are used primarily as embellishments and maybe in order to depict the learning of the writer. Folio 19 has a particularly interesting account of an Ahom kataki (perhaps someone else other than the writer) meeting with Ram Singha in the Mughal camp. In his typical style of narration, the writer uses dialogues but here the speech is quite unlike anywhere in the manuscript and he describes this as ‘farsirmāt hindurakṣar’. We do not know if the writer knew any Persian at all but one can be certain that he was using words as he heard during his interactions in the Mughal camp (and hence the prose reads quite imperfect) in order to write what he calls the speech of the Persians or farsirmāt. The mention of hindurakṣar is particularly important because Bhuyan would later use the exact same word for the various Assamese script forms (there were four such script forms in seventeenth and eighteenth-century Assam). We have not come across any other seventeenth or eighteenth-century manuscript that uses the word. It is highly likely that Bhuyan stumbled upon it in this manuscript and took this to be a representative term for the premodern Assamese script forms. Thus, as we see here, it was not just information but even common prejudices and ideas that linked Bhuyan and the unnamed Ahom scribe and their respective historical accounts of the Ahom-Mughal encounter. 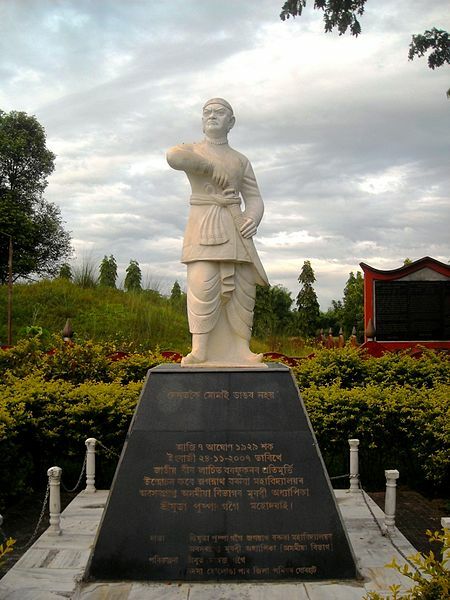 Undeniably, Lachit Barphukan is a symbol of Assamese nationalism and has gained popular currency. The story of his valour in the Ahom-Mughal encounter has been retold in multiple ways and included in school textbooks. Radio also played a significant role in popularising the valour of Lachit among the general masses. 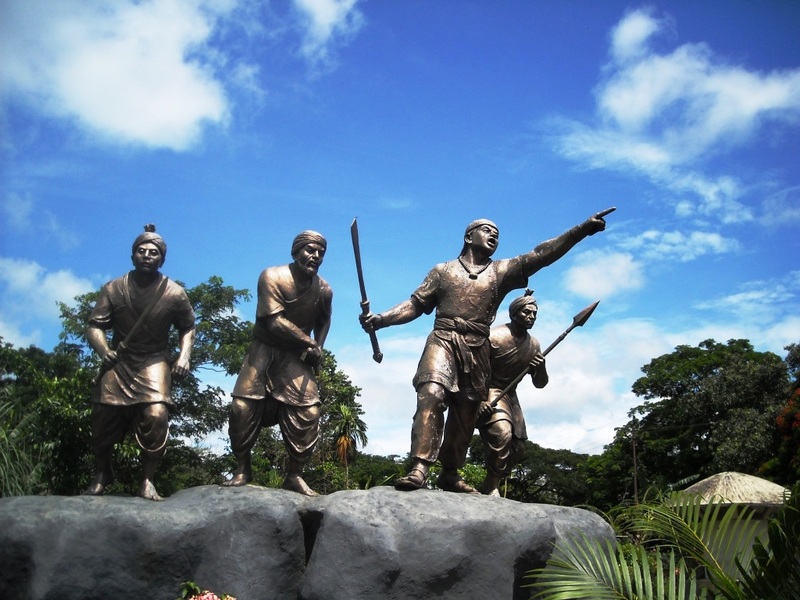 Lachit Barphukan, a play written Prabin Phukon became one of the popular ones being broadcasted by radio in Assam, along with plays such as Maniram Dewan, Kushal Konwar, Piyali Phukan, Lavita and Tikendrajit. The use of hengdan as a symbol of his valor has also found its expressions in autonomy and identity movement of the Tai-Ahoms. The idiom of Lachit has been re-articulated by a certain kind of narrative that constructs him as a ‘national hero’ and even relegates Ahom-Mughal encounter as one between Hindu and Muslim. Earlier this year, the Governor of Assam, Banowarilal Purohit relegated Lachit to ‘saviour of Hindutva’. Given such contours of discourse, re-visiting the archive becomes necessary to understand and explain events such as Saraighat and similar such events that have come to be told, narrated and appropriated in multiple ways. The victory of the Ahom army over the Mughals has long been a part of a long commemorative culture. The mode of remembering the event through the construction of sites of memory gained momentum with the emergence of Assamese nationalism in twentieth century. However, not all materials associated with commemorating this event belong to twentieth-century Assam. In this section, we present two such material sites of commemoration (in metal and stone) and a document (in agar bark) that date back to late seventeenth-century Assam. The first is an inscribed bell-metal canon that dates back to 1682. The inscription is in Sanskrit but in Old Assamese script forms. The canon dates back to the time of Swargadeo Gadadhar Singha and records the defeat of a Mughal army at the hands of the Swargadeo’s army. This battle was fought after the famous Battle of Saraighat and was probably not as significant as the former. Nonetheless, the victory of the Ahom army was memorialised in the inscription. It is currently located in the Assam State Museum in Guwahati (ASM 284). The second object is a stone inscription that dates back to 1667. This was found in Fatasil, a region located in Guwahati, Assam. It is a particularly curious object because it seems that the inscription was made sometime during the course of the long battle that went on for more than a year. However, this was done at a point when the Ahom army was sure of their victory over the Mughals. The inscription is in Old Assamese and it mentions Lachit Barphukan as Nāmjani Barphukan. It is currently located in the Assam State Museum in Guwahati (ASM 416). The third is a folio from the manuscript Asamat Rām Siṇhar Yuddhashowing the sketch of a combat plan made by the unnamed Ahom chronicler. The manuscript as mentioned above dates back to 1670. This essay was originally published in Pangsau, and has been republished with permission. Read the original copy here. Suraj Gogoi is a doctoral candidate in Sociology at the National University of Singapore. Through his doctoral dissertation, he aims to write a social history of water and understand state-making in contemporary Assam. Suraj tweets @char_chapori. Samyak Ghosh is a doctoral candidate at Columbia University, New York, and an editor with Pangsau.